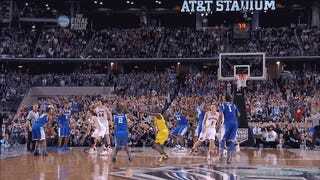 What Will Aaron Harrison Do Tonight? Kentucky guard Aaron Harrison has hit clutch shots in the Wildcats' last three games to help deliver them to tonight's national championship bout against UConn. The last two came in the games' final seconds, and bore such a remarkable similarity that we made a composite of them in the GIF you see here. Of course, recent history teaches us the players upon whose heroics a team reaches the title game collapse once they reach that biggest of stages. What can we expect tonight in Arlington?